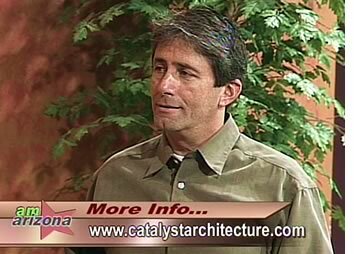 PRESCOTT, AZ– In the November 13 airing of KAZ-TV's AM ARIZONA broadcast, CATALYST ARCHITECTURE partner Matthew B. Ackerman shared his thoughts on what he called "common-sense planning and design". The station's title for the segment, "Sustainable Sprawl" is somewhat contradictory, Matt pointed out in his opening comments, as "…there's nothing really sustainable about sprawl". The topic has become an important one as many local citizens are worried about new sprawl and the resulting traffic congestion, loss of open space, and the apparent degradation of our environment. Matt advocates higher densities and mixed-use development as a solution for this unplanned and unchecked growth. Mixed-use buildings typically have retail spaces on the first floor, with either office space and/or residential units above. This type of development "brings vitality and life to a community center. Our historic Downtown Square and Whiskey Row areas of Prescott were originally developed this way" Matt explained. Matt referred to a recent presentation he gave at Prescott College during which it was pointed out that our current zoning laws and building codes actually do not allow us to recreate the charming, higher density, mixed-use character that everyone associates with downtown Prescott– at least without going through a very time consuming and costly approvals process. So much development is done privately, that unless we have an actual partnership between private and public development interests, it is extremely difficult to create any truly meaningful civic space. Matt went on to say that our current zoning regulations, more often than not scare away forward-thinking developers from attempting more sustainable projects. Matt has recently been serving as chairman of Yavapai County's newly formed Sustainable Planning Committee, charged with looking at the County's current planning and zoning codes to assess what impediments there are to more sustainable planning and building practices. Mr. Ackerman recently made a presentation to a joint session of the Yavapai County Supervisors in which he felt that the Supervisors were "receptive" to the ideas he had presented. While Matt expressed his support of those who prefer to their "wide open space" lifestyle, he pointed out that "unless we move to allow more efficient development patterns as a matter-of-right, at some point there won't really be any wide open spaces left to enjoy". "We need to support higher-density and mixed-use development options, in order to provide greater choices for those either living in, or moving to the county. More 'sustainable' living and working options beyond the current 2-acre per lot base density, which is unfortunately resulting in the kind of land and resource consuming sprawl no one is really happy with". "We are really at a crossroads," Matt explained. "Positive changes are happening, but I personally feel an urgency to the situation. Unless we are willing to take a look at our current planning and zoning practices, and then make some creative changes, the current patterns of growth threaten to overrun us." With a background in Urban Design, Matthew B. Ackerman, LEED AIA brings over 20 years of design experience in mixed-use, master planning, commercial, and custom residential work. He is currently serving as chairman of Yavapai County's Sustainable Planning Committee, as well for the AIA's Grand Canyon Chapter of COTE (Committee On The Environment). Matt was the first U.S. Green Building Council LEED™ Accredited architect in Yavapai County.